Global Indices crucially poised- Emerging markets seem a little better. Dow Jones/European Indices and China are coming close to recent lows and are crucially poised.A drop below the lows could take those indices another 4-6% down. 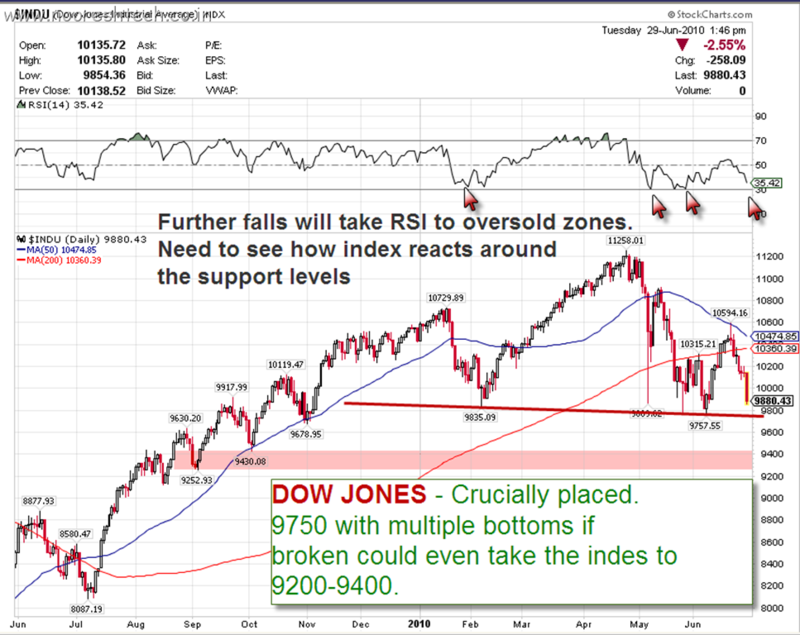 Although any further falls would take them into oversold zone on RSI. 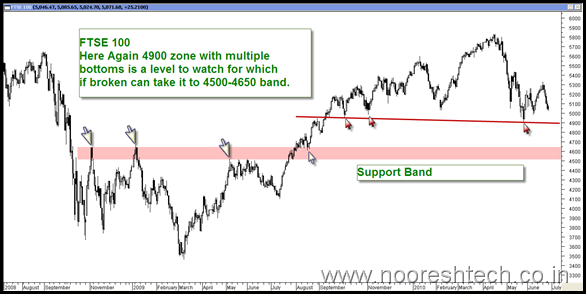 So next few sessions need to be seen carefully as to how global markets react around the support zones. 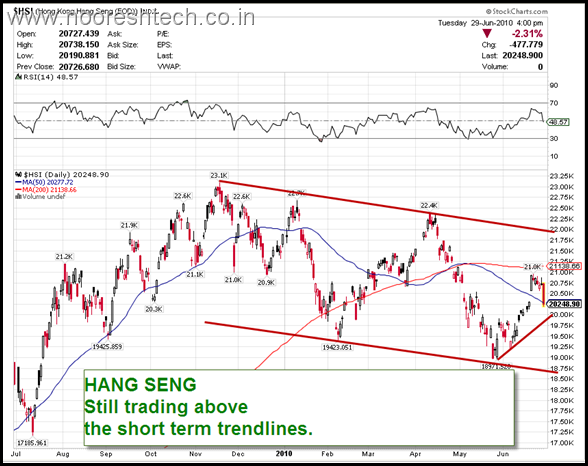 In the last couple of weeks emerging markets like Hong Kong,India,Singapore,Brazil etc have shown quite a lot of resilience by holding on to short term trendlines and supports. It needs to be seen whether they follow suit if Global markets continue to drag. 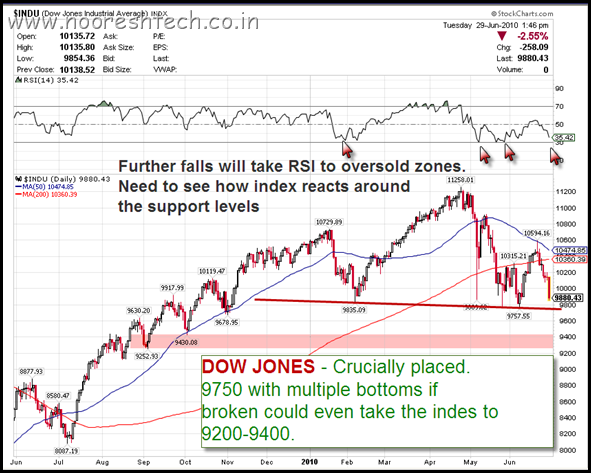 Bottomline: After utilizing the bounce from 16k Sensex and 4800 Nifty we need to now just wait and watch. Avoid leverage and keep strict stoplosses to conserve the gains made in last few weeks. Profit booking was advised way earlier at 17300 itself. Can take small positional longs if global indices show signs of bouncing back. 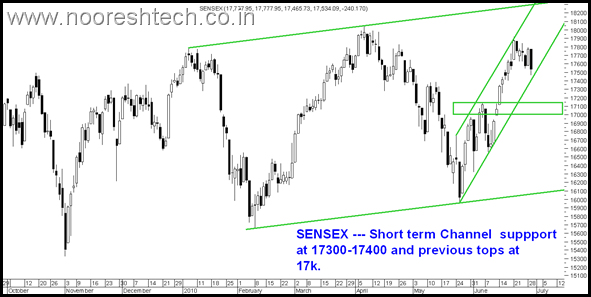 Supports for Sensex 17300/17000 and Nifty 5200/5140. Charts for all the indices with view posted below. Real Estate stocks gave a stoploss hit and quite others took small trailing stops. Rest did not trigger much of follow on buying. Keep strict stoplosses of 5-8% on any short term trade to conserve earlier gains. Excellent chart explaining the Global Indexes. So 17400 is the next level for the Sensex. what is your call on Max India and oil companies? What would be your target on Dhanlakshmi Bank, now that it has moved to 190+ levels?